A Lovable Series ~ ! After watching the first episode, I wanted to quit watching right then and there. However, I pushed through and decided to watch the second episode. After that, I started to fall in love with the series. The thing is, that there are real-life experiences within this anime. Everyone is different and lovable in their own way, and have grown to become better friends, people, and idols. Their personalities, interests, and images may seem silly, but I believe that's what made them great. I don't believe that this anime was dry or dull; instead, I believe that it was worth watching. Yes, it will start off with some selfish girls, a production that seems to not know what they're doing, and may even seem a little childish. But if you will watch them grow! You will understand why The [email protected] is so relatable! I read the reviews and saw a lot of people say it was a great show but the first few episodes were slow and somewhat boring and...they were 100% right! It didn't really kick off for me until maybe episode 5 (not to say it was awful but just not incredibly interesting) and I was worried I wouldn't be into the show after all. Before I knew it, however, I couldn't stop watching it. It was so good! I really, really loved it! The characters were great and the way they all responded to each other was so refreshing. It wasn't a show about internal rivalry or a harem for the male producer, which is what I feared it might become, but about friendship, about pushing forward and persevering together as friends. The way they all supported each other and cheered each other on, how they overcame all of their personal and professional problems - it was really moving and fun. The show went by so quickly and, while I was sad to see it end, it ended very well. Definitely push through the first handful of episodes. It will pick up and turn into a really beautiful show. As you can see, there are only few male character, the female characters easily outnumbers the males. Sounds familiar right? You probably be thinking, this is going to be harem. You won't be able to find anything deep like Evangelion did, something that makes you think. Yeah, this anime was a straight up fast food, eat it and proceed what you were doing before. But here is the inevitable part about fast foods. You are going to come back for more..... damn it. I mean, I absolutely love the very broad universe and I love the characters so much I am writing a fan fictions for it. This wasn't a harem anime, this was about imperfect characters building off each other. You are going to find fault in it, just like you probably find in many other works. I can write a review about this anime forever, that's how I much love it. Come on, give it a try, but here is the trick, find a character you like and watch the episodes that casts her. Because time to time I find most of the characters with minimum depth. But my question is, how the heck is Love Live more popular than this? #256. Seeing is believing, and this is the best idol anime! THE [email protected] is an idol anime about the staff and talent of 765 productions. As a fairly young production studio, the twelve idols and four staff members 765 productions boasts are all ready and eager to become top idols! The anime itself is very simple, and very sweet. All the characters (not just the idols) are just entertaining and fun to watch episode by episode. Even when negative occurrences happen to them, everyone comes together to help each other towards a positive ending in every episode. Which is [email protected]'s biggest strength, the power of positivity! So good that I dare say that over the course of it's 25 episodes filled with fun idol shenanigans, it has completely stolen my heart and become one of my favorite idol/musical anime. It's large and charming cast pulls you in, and with great animation with many original songs, everything just end up working damn near perfectly. If your looking to get into the world of idol anime, then wait no further, THE [email protected] has got you covered! Still watchable after all this time! This show still puts a smile on my face after all this time. I'll re-watch this whenever I get the chance. Not much to say but to show the longevity this show can bring after all this time. It's a show that express all sorts of feelings just by watching these characters working hard and push forward in life when things don't turn out the way it was planned. Just cute girls just doing there job of making people happy as idols. Watching them makes my smile! Funny, lovable and written with heart. This series is worth your time. Fact, [email protected] has a higher than average barrier to entry. The first three episodes are (arguably) the worst in the entire series, but with good reason. For first time watchers, know that the series rewards patient viewers, yet the show is misleading because a huge cast, with smiles everywhere, it gives the impression that this must be yet another moeblob anime right? Thankfully the rose tinted glasses do not stay on for the entire length of the show, and unexpected but organically appearing drama will burn the memory of this show in the minds of its viewers for months after the last episode comes to a close. If you enjoy music, and want a series that will pleasantly surprise you, then look no further. This is a proper adaptation of a video game into an anime, it is simply worth your time. PS: The movie is also highly recommended. PPS: Xenoglossia does not exist, do not search for it nor watch it, trust me. This series is definitely one of the top Idol ones in everyones books and i love how each episode is directed to a person growing or overcoming their fears. I have high hopes for this series and hope they stick with the theme they have set up. Keep up the good work! The story about thirteen Idols, one producer, and A Lonely receptionist, Is a Cute, Lighthearted Tale that everybody should watch. 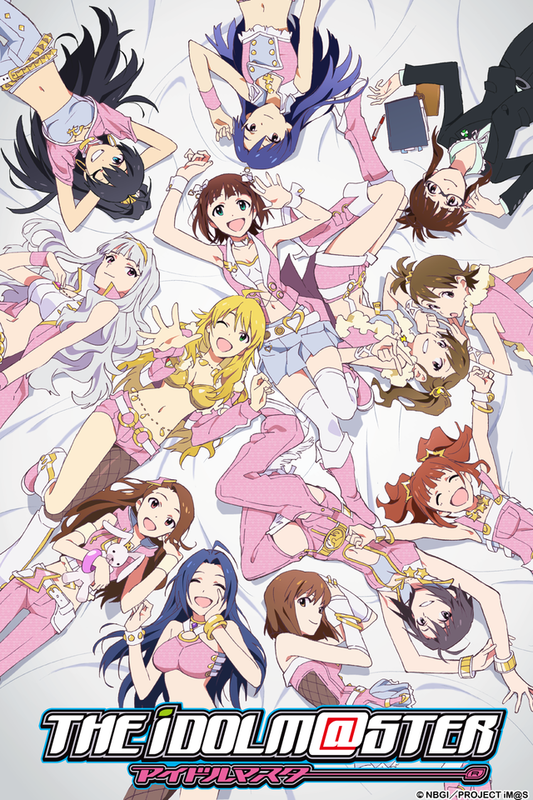 Each Episode focuses on An Idol (Miki Hoshii, Haruka Amami, Chihaya Kisaragi, Ritsuko Akizuki, Azusa Miura (My Personal Favorite), Yukiho Hagiwara, Makoto Kikuchi, Yayoi Takatsuki, Iori Minase, Hibiki Ganaha, Takane Shijou, Ami Futami, and Mami Futami.) and Her way to stardom! I personally love this anime. I really want a second season. It may have hints of shoujo ai here and there,(MakotoxYukiho) But it is not very obvious. They stay best friends throughout the story. During one night after her promotion, Miki and the Producer decide to walk back to the 765 Production building together. Being carefree and curious, Miki stops in the middle of the street to play with a cat, then suddenly a truck comes storming up the street, heading straight towards Miki. The Producer, who sees the truck coming, acts quickly. He dashes in to push Miki out of the way, ending up being hit by the car instead of her. Shocked, Miki rushes to the Producer's aid, not knowing what to do at all. Her body trembling with fear, all she can do is cry. The Producer, after saying his last words to Miki (which can be chosen by the player), wakes up a few hours later in the hospital only to find out that his injuries were simply a fractured leg. Miki, trying to help as much as possible, begs the Producer if she can be of any assistance and (this can also be chosen by the player) carries him out of the hospital, back to the 765 office. Before the day ends, Miki begs for forgiveness and after the Producer states that "it was nothing", the two part ways for the day. Next week's morning, Miki rushes to see if the Producer is okay, and having recovered from his injuries, the Producer and Miki start their day. Miki states that she will change for the better, saying she will never take anything so lightly again. Later that night, Miki asks the Producer if he likes short-haired girls (the player can choose how to answer), and the next week Miki walks into the 765 Production office, only to have had her hair cut and stopped dying it blond. Taking a complete 180 degrees turn, showing her "awakened" self, the new version of Miki is an extremely powerful girl, being strong-willed and much more hard-working than all of the other idols combined tenfold. She puts in her complete dedication and effort at literally anything, and all of her lazy traits have disappeared; she doesn't even yawn anymore, and does anything the Producer says without hesitation. In fact, she has also become infatuated with, or even madly in love with the Producer and claims him for herself, calling him "Honey" instead of "Producer". When I'm watching anime I can be really picky. It has to have a variety of characters. These Characters are all magnificent. Theres a whole bunch of characters you can relate to. I would highly recommend this for people who are looking for humor, characters to relate to, with good music.The only problem I have with this anime is it has a slow pace to it.